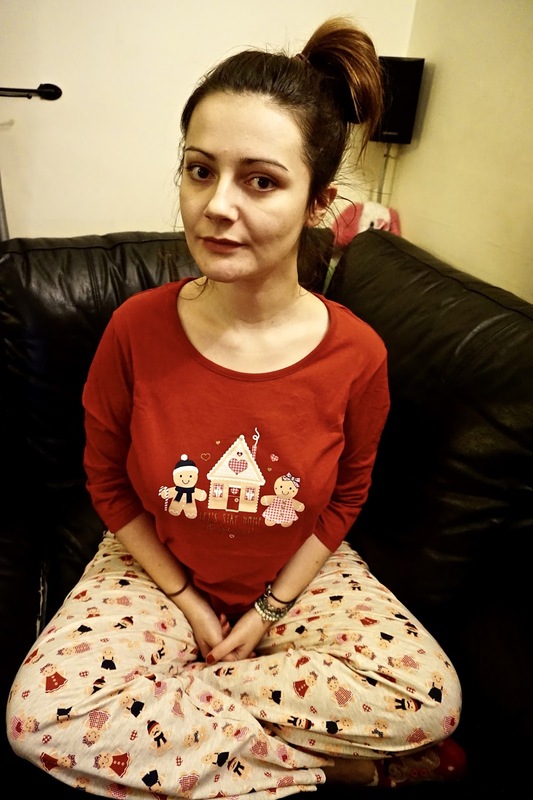 So, as it's Christmas time, and i'm majorly in the festive spirit this year, i thought it was only right that i bought some Christmas pyjamas! Everything i'm wearing is from F&F at Tesco and wasn't very expensive either! The pyjamas were only £10 and i absolutely love them, they've got gingerbread all over them and i think it's super cute. 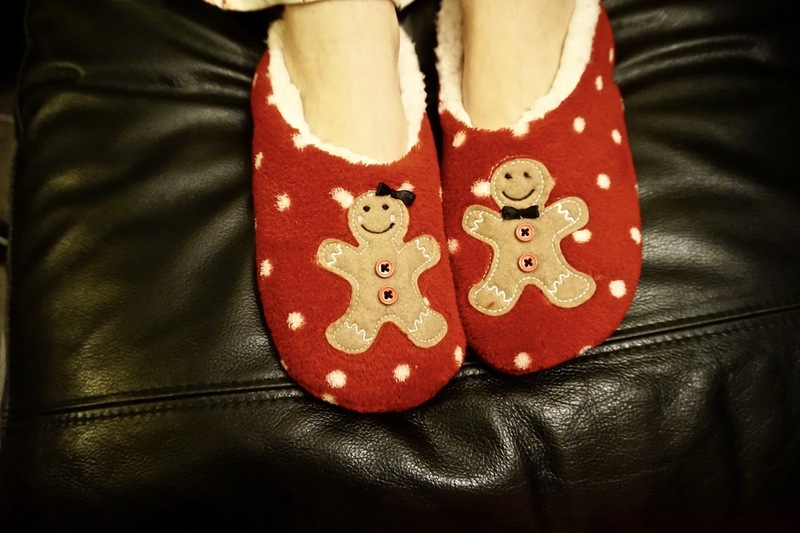 I also bought these ginger bread slipper socks which i think match the pjs perfectly! Here is a close up of what the front of my pyjama top has on it. It has a man and woman gingerbread on it standing next to a little gingerbread house. Underneath the house, there is a little bit of writing that says "Let's stay home & get cosy" which i think is adorable! This top has 3/4 length arms which i think is great as it means you're neither too hot nor too cold, i think it's 100% the right length. These are the pyjama bottoms! Aren't they just lovely! It has little gingerbread people, men and women dressed in cute little outfits. 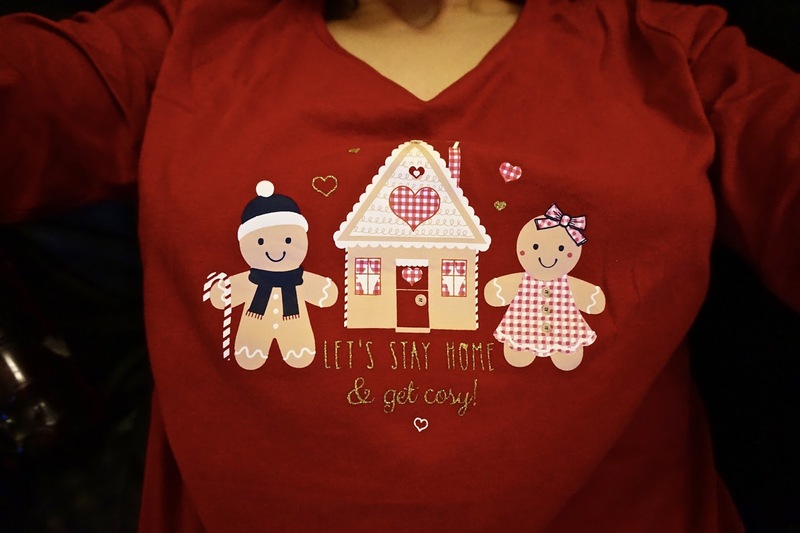 I think they are perfect Christmassy pjs and i absolutely love them! They are so comfy to wear and easy to move in and oooh they're just lovely! I had to buy these slipper socks when i bought the pjs, as like i've already said, they match perfectly. They are fleece lined which makes them so cosy and they keep my feet so warm. They are red with white dots and a little gingerbread man on the front of them. I've been wearing them a lot and they are just so lovely to wear. Have you got any festive pyjamas?